I never before considered tofu could be a dessert. Then I went to China. It boggled my mind what the Chinese can do with rice or tofu when given half a chance. See some of the local delicacies and fun our buddies introduced us to when we went out to dinner with them. Even Sunday night of that week was eventful. Three of my girlfriends and I met up with our local buddies and they took us out to dinner. As I said earlier, at the beginning of the semester we were assigned local buddies to help us acclimate to Hong Kong, and although most of us had already gotten busy and didn’t really bond with our buddies. My friend Jen and her buddy Stephen stayed in touch though, so Jen, her roommate Ilaria, Stephen, his friend Cherry, Abby, and I all went out to dinner to a local little restaurant that specialized in “clay pot rice.” It tastes so much better than it sounds and looks, believe me. Claypot rice consists of a steaming pot of chewy rice covered in a variety of toppings and a slight hint of charcoal from the cooking fire. It’s especially popular during the winter, and the most unusual part is the slightly crispy rice you can pull off the bottom of the pot at the end. 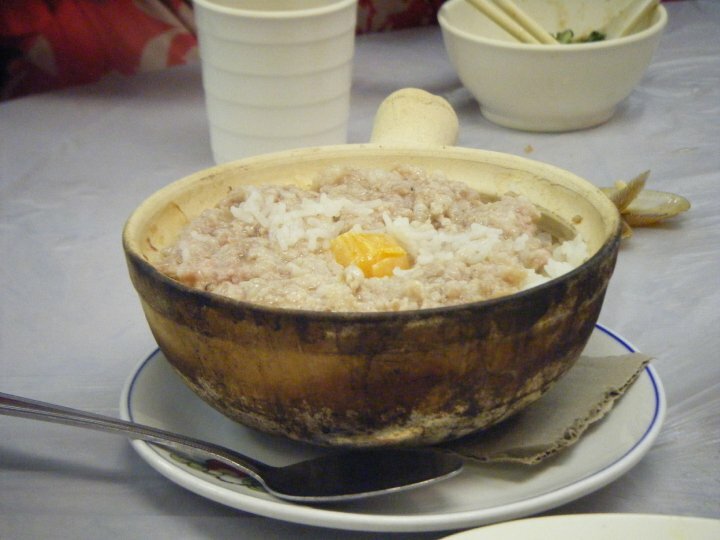 Potted rice with a duck egg cooked on top. There was some great soy sauce we poured over it too that was delicious. The entire menu was in Chinese, so the four of us just sat and chatted happily while Stephen and Cherry debated what to order and actually did the ordering. The whole meal turned out to be delicious and we had dishes including bok Choy, fried scallops, duck egg steamed clay pot rice, chicken and sausage steamed rice, beef in sauce, and clams with black bean sauce. 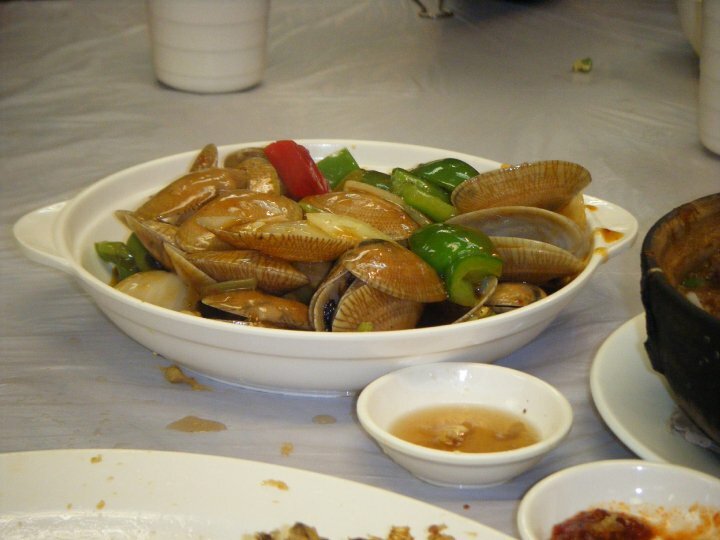 Clams in black bean sauce. Very tasty. After dinner we went into a nearby mall and Cherry showed us an arcade made up entirely of Japanese photo booths like the ones in the US only better. In these photo booths you paid a little more money and you not only got to do five or six crazy poses, but after taking the initial pictures you could go around the outside of the booth and decorate the pictures on a computer screen adding in things like cartoon hearts and flowers, changing people’s hair colors, adding sparkles to eyes, writing words in pictures, etc. It was great fun and after the tiny pictures printed out, a man at the front desk cut them up individually and we each got a set of four pictures which we could laminate together on a piece of plastic as a keepsake. Really goofy keepsake – but fun at the same time. To cap off the night, we went back onto the street and found this tiny restaurant which specialized in tofu desserts. 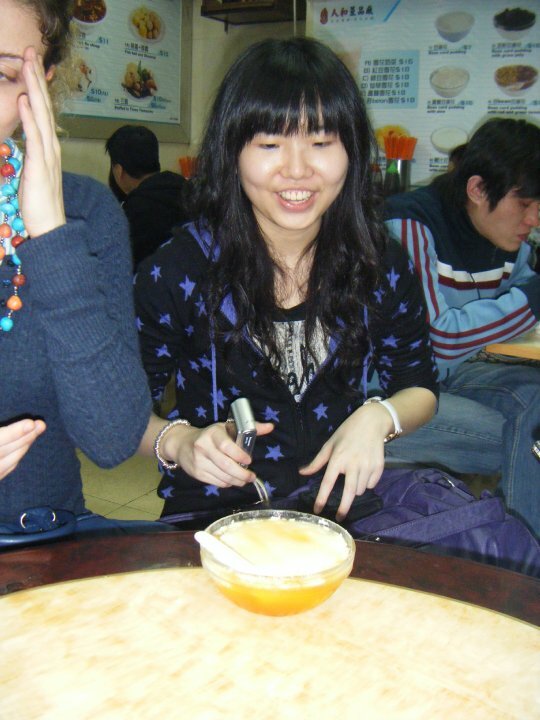 No kidding – they can make tofu into a dessert in China. There were all different flavors available too: fruit and tofu, coconut milk and tofu, ginger and tofu, sesame and tofu. Plus you had to choose if you wanted it hot or cold. There was a choice? Based on our buddies’ recommendations, I got plain tofu, Abby got coconut milk, and Jen got fruit topped. Sadly, we didn’t discover there was this special orange sugar you can sweeten the tofu with until we were all almost finished, but at least now we knew for next time! Stay tuned for the next exciting installment – Rugby Sevens came to town and I got up close and personal with viking warriors! This entry was posted in Asia, Hong Kong and tagged Asia, Hong Kong, Photo Booth, Rice, Tofu, Travels on March 21, 2014 by Paige N.. I love Tofu and all things that people do with it. Really cool that they make it for dessert in China. Thanks for sharing!